Dang girl dang! 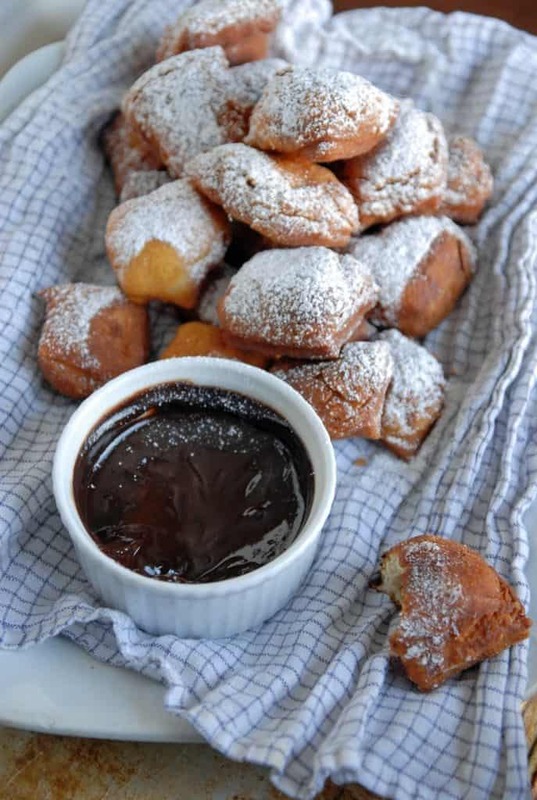 Is that what you are saying right now, because that’s what I said to myself when I was solely experimenting with this vegan beignets recipe and it WORKED. You know that happy/delighted dance you do when you just took a bite of something awesome (it’s a little bit of hip shimmy and a lot of fist pumping), that was totally happening with these. I was completely blind-sighted by Mardi Gras creeping up on us (it is March after all, despite what that pile of snow outside my door is telling me). When I saw Christina over at Dessert For Two posting beignets, I knew I had to give it a go, just to see if vegan beignets were even possible. 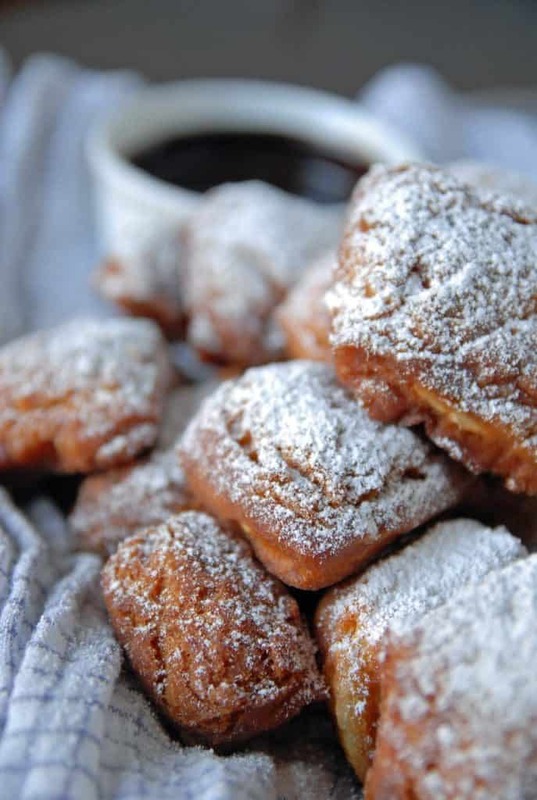 I myself have never been to New Orleans, but vegan beignets remind me of a certain sweet lady, Marie, who owns a coffee shop in my hometown. 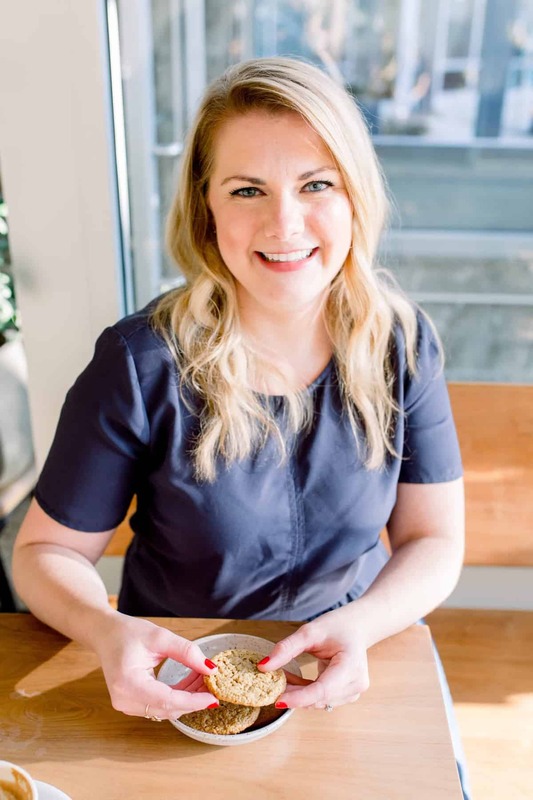 Marie is from Louisiana and still has the sweet Southern twang in her voice, always reminding me that hugs and hospitality are the ways to anyone’s heart (and a cup of their signature coffee doesn’t hurt either). 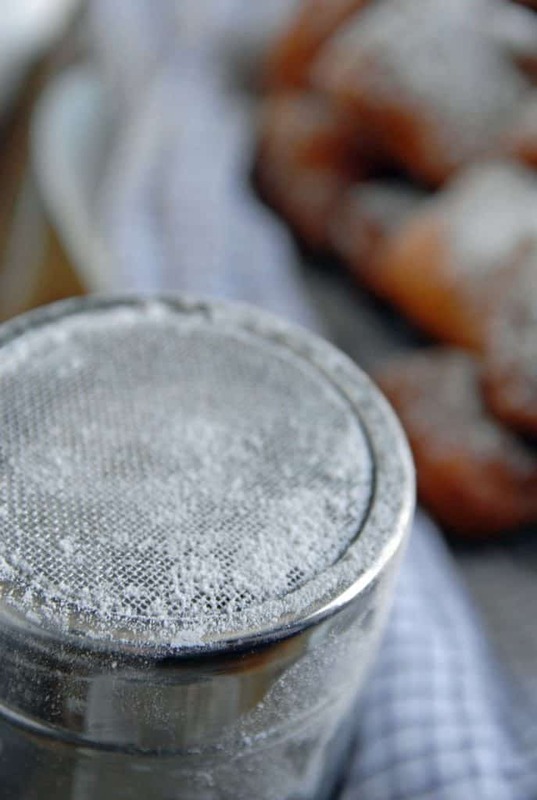 Since moving away, sweet Marie and I have been trying to find a time when I am back home visiting to make beignets, just the way she remembers them from Louisiana. Not only is Marie the owner of my favorite coffee shop, but she is the first one to remember your name, ask how so-and-so is doing, and offer a piece of a freshly baked cinnamon roll hot out of the oven. Due to conflicting schedules and busy lives, we still haven’t found the chance to bond over fried pieces of dough, but these beignets are made with love for Marie, who always makes me feel like my table at the Java Hut is a little piece of home. In a small bowl, combine the warm water, active dry yeast, and pinch of sugar, set aside until foamy (about 5 min). While the yeast is setting, whisk together the applesauce, sugar, non dairy milk, and apple cider vinegar+baking soda in a small cup. Whisk together with very hot water. Add the activated yeast mixture and whisk until combined. Stir in the flour until combined. Cover the dough and let rest for at least an hour. In a deep pot, heat the canola oil over medium high heat. Meanwhile, flour your rolling space and roll out the dough to about 1/8 to 1/4 inch thickness. Using a pizza cutter or a sharp knife, cut the dough into 1-2 inch squares. When the oil reached 360 F, drop dough in, taking care not to crown the beignets. Make sure you stay close as they fry, the first side will cook very quickly (1-2 min), turn each beignet over when first side is cooked and ensure the other side fries as well (additional 1-2 min). Remove from oil with a slotted spoon and transfer to a paper town lined plate. 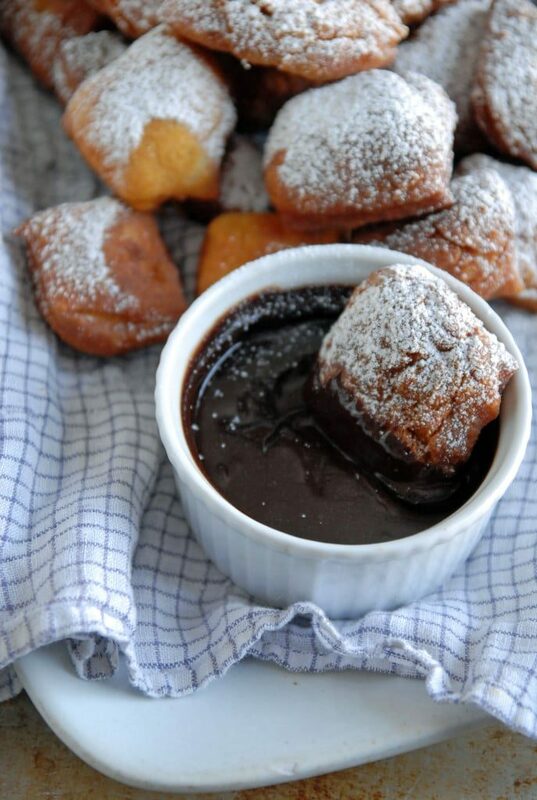 When all beignets are cooked, sprinkle with powdered sugar and serve with dark chocolate espresso sauce. To make the sauce: In a small, microwave safe bowl, combine chocolate chips and non dairy milk, microwave for 45 seconds to 1 min, keeping an eye on the sauce. When chocolate is almost completely melted, remove from microwave and stir in espresso powder. My jaw literally dropped when I saw the title do this post. No. Way. You are amazing. Thanks Lindsey! I need help eating the leftovers! Yum! So glad you made them! They look awesome!! OMG. That is all I can say. These look amazing, now I’m craving chocolate. Pinned. I love beignets. And the sauce would be perfect! goodgolly you are a baking genius! Thanks for sharing the recipe! I don’t suppose you’ve ever tried making vegan pain au chocolat? How many does this recipe make approx? Can’t wait to try them!! !